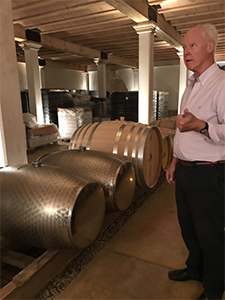 Upon arrival at Perpignan Airport in Southwest France, a charming Gilles Sansa greeted us and engaged us with his personal tour of vineyards and villages in the area before dropping us off at the European Waterways ultra-luxury barge, Enchante. It was docked about an hour away in Trebes on the 300-year-old UNESCO heritage Canal du Midi, the oldest functioning canal in Europe. Legend has it that over a dozen years 15,000 men and woman dug ditches by hand that would one day enable a more efficient transport of goods. Once we reached the barge, the five English-speaking crew members led by Pilot Captain Elie Ficher were eager to pamper. They greeted us with Champagne as we boarded the double-decker hotel barge Enchante, our floating home for the next six days. 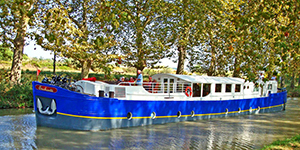 Enchante is the largest hotel barge on the Canal du Midi. In fact, it was too lengthy at one point; owners had to cut down eight inches. “We built the boat to be the biggest boat on the canal,” explained owner Louisa Gronow. The canal is operated by the government. And, although it is the smallest in France, it permits barges to go from one canal to another as we did on the Robine Canal which links Narbonne to the Mediterranean. 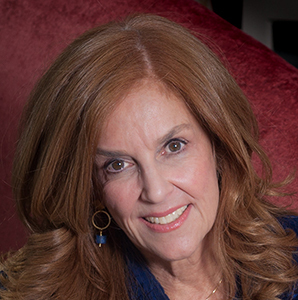 Soon after, enthusiastic hostess Sheryl Gilmore, who described her job as “in charge of sparkles” showed us to our suite on the lower deck, one of four comfortably appointed guest suites with private bath. Barging is a way of life for Enchante owners, Roger and Louisa Gronow. The couple met on this same canal while crewing for European Waterways. They lived their dream and refurbished two barges of their own. The Enchante, once a mid-century Dutch freight barge, now has a bright art deco style and spa pool on deck. Our gentle paced journey navigated under bridges and through locks—all automated—including a steel triple lock system. We stopped daily to explore small villages via foot, bicycle or van including Carcassonne, a walled medieval city with 52 watch towers. We walked the ancient streets of this Gallo-Roman era UNESCO World Heritage site while taking in the Camelot setting. The region is just south of Bordeaux and bordered by the Pyrenees. Wine-making is a way of life here, but the wines are not as well known—yet! As a wine aficionado, I learned that the Southwest Languedoc-Roussillon region has 120 indigenous grapes and over 300 varieties making it France’s fifth largest wine-growing region. The unique wines, creative blends offering versatility at affordable prices are gaining attention. After a successful career in the financial arena in New York, Nutter “recycled” himself by not only buying a vineyard but involving himself in every detail of wine-making using the latest technology including stamped stainless steel barrels from Northern Italy to eliminate leakage and evaporation of whites. He further combined lifestyle with wine-making by converting an old barn into a tasting room and a hay barn with a music room where he holds concerts with name musicians from Paris and elsewhere. We drove along the windy and hilly Route 20, a popular path for wine lovers; roamed Narbonne’s colorful indoor market where olives, tapenades, cheeses, bread, spices, meats and fresh fish were artfully displayed. It’s a hub for locals who gathered at wine and tapas bars in the center. 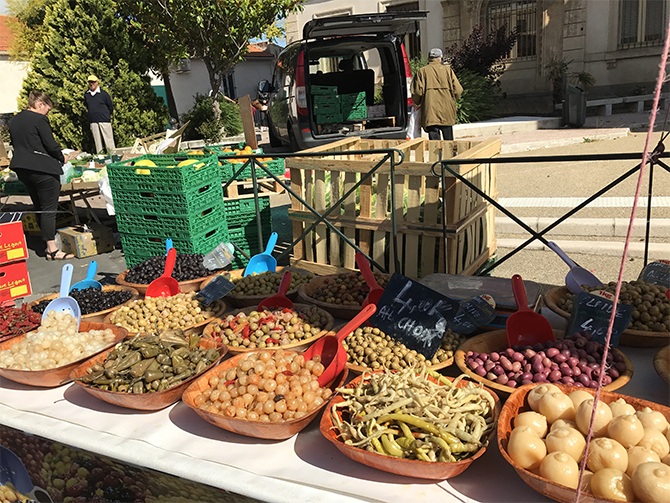 Other stops included a local cooperative olive oil press and sampling Lucques olives and oils; the spectacular town of La Grasse and its 8th century St. Mary Abbey where visitor donations are believed to reserve a place in heaven. A delicious lunch of duck confit on the patio at Abbaye de Frontfroide was one of the only meals off-barge followed by a visit to the hilltop village of Minerve, which has a winter population of 40. While strolling along the canal one afternoon, I spotted La Librairie Ancienne du Somail, an old bookstore where I watched workers clean the books by hand before carefully wrapping them in clear plastic. Chef Sylvain Moretto of Dijon has been perfecting his culinary skills on barges for 15 years. I watched him in the open galley create masterpieces from perfectly timed individual four cheese soufflé to profiterole swans with homemade ice cream on a lake of chocolate caramel. He caters to dietary needs and all tastes. A good example was when one guest preferred something other than escargot. 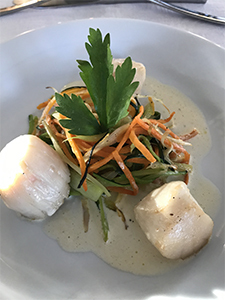 The chef substituted mushrooms—same color and texture—along with the same delicious garlic cream in puffed pastry sail. Cheryl’s creative and sparkly table settings were a surprise each meal as were the wine pairings with each course and the nightly cheese selection. Another important choice involved the chef’s expertise at rapidly chopping tomato, zucchini, shallots and mint without blinking—his version of a fish sandwich with the veggies in the middle. The crust, a mixture of rock salt and egg whites served as crust. The result was fish steamed to perfection. On the way to the airport from our final stop, Salleles d’Aude, I spotted the highest mountain of the Pyrenees, Camigou, and reflected on the benefits and joys of slowing down and barging through nature and well-preserved history. Barging is seasonal with trips from April through October. For more information on the Enchante, visit europeanwaterways.com. To read the published article in New York Lifestyles Magazine, click here or go to http://newyorklifestylesmagazine.com/articles/2017/08/35.html.